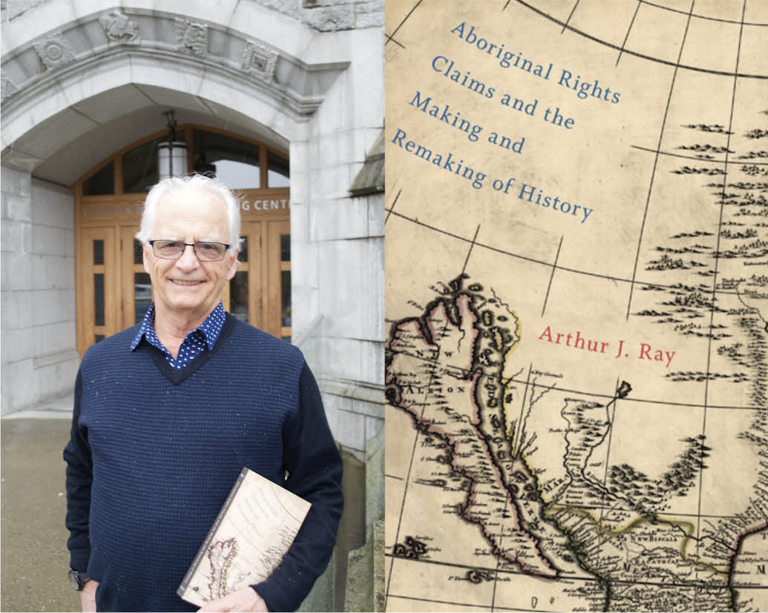 Arthur J. Ray has won the Basil Stuart-Stubbs Prize for outstanding Scholarly Book on British Columbia for his book Aboriginal Rights Claims and the Making and Remaking of History. The $1,000 prize, given by UBC Library and the Pacific BookWorld News Society, will be awarded at UBC’s Irving K. Barber Learning Centre in June. Published by McGill-Queen’s University Press, Ray’s book is a masterfully-written examination of land claims litigation between Indigenous peoples and the settler societies of the United States, Canada, Australia, New Zealand, and South Africa that powerfully demonstrates the important role proceedings in British Columbia played in events of global significance. “We are thrilled that this year’s Basil Stuart-Stubbs prize has been awarded to a book written by a UBC faculty member,” says Melody Burton, UBC’s Interim University Librarian. Arthur J. Ray is a Professor Emeritus in the Department of History at the University of British Columbia and has served as the co-editor of the Canadian Historical Review from 2003 to 2006. He is the author of several other books including Telling it to the Judge, An Illustrated History of Canada’s Native People and Bounty and Benevolence. Yakuglas’ Legacy: The Art and Times of Charlie James by Ronald W. Hawker (University of Toronto Press). The Basil Stuart-Stubbs Prize for Outstanding Book on British Columbia, sponsored by UBC Library and the Pacific BookWorld News Society, recognizes the best scholarly book published by a Canadian author on a B.C. subject. The award was established in memory of Basil Stuart-Stubbs, a bibliophile, scholar and librarian who passed away in 2012.Stuart-Stubbs’s many accomplishments included serving as the University Librarian at UBC Library and as the Director of UBC’s School of Library, Archival and Information Studies. Stuart-Stubbs had a leadership role in many national and regional library and publishing activities. During his exceptional career, he took particular interest in the production and distribution of Canadian books, and was associated with several initiatives beneficial to authors and their readers, and to Canadian publishing.